An ingrown nail is a condition in which a portion of the corner or side of the nail presses into the soft tissue or skin of the toe. People can experience this problem in any of their toes, but it most commonly happens in the large toes. When the condition goes untreated “proud flesh” tissue buildup can occur causing a red bulb-like area of skin to form along the nail border (see diagram above). 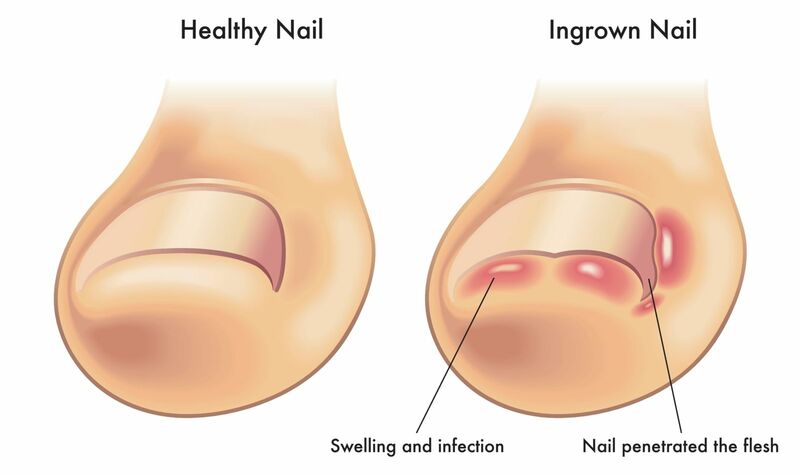 What causes or promotes the growth of an ingrown toenail? IMPORTANT: it is highly advised to seek medical advice before tampering with any type of nail problems seemingly related to the symptoms associated with ingrown toenails. Improper treatment done at home can escalate your condition into something worse like a serious infection, loss of the nail, or damaged tissue. In severe cases amputation is necessary when ingrown toenails are not treated by a knowledgeable professional.